Part of retiling the master bath in our mobile home required removing the toilet. When I put it back in place, Murphy’s Law kicked in and of course it was leaking from behind the nut on the supply line at the tank inlet. Since none of the plumbing fixtures, like most mobile homes, have shutoff valves, a leak or repair requires the water main be turned off. This cuts the water to the entire trailer. It’s a bother. I devised a plan to not only repair the leaky toilet, but install a shutoff valve. It’s easy, requires only two parts, and takes less than 20 minutes. 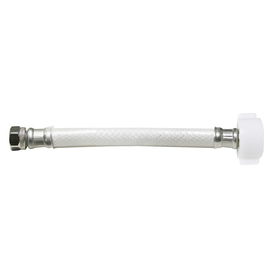 and a standard 3/8″ toilet tank supply line (~$4.50). If you don’t have any pipe tape, you’ll need to grab some of that when getting your other parts. For tools you simply need a sharp knife or heavy shears, a crescent wrench, and a rag or paper towels. The rags are optional, but you will spill water and need to mop it up somehow. Flush the toilet and soak up the little water left in the tank. If there’s a lot, use a cup to empty it into the bowl. Disconnect the tank supply line by unscrewing the nut at the base of the tank. A little water is still going to be in the pipe, but it won’t be under pressure. With your knife or shears cut the 1/2″ supply line below the existing nut. Get your cut as straight as possible and be sure to leave enough pipe to work with. Hint: You can leave it long and push it back into the floor to shorten it when you’re all done. 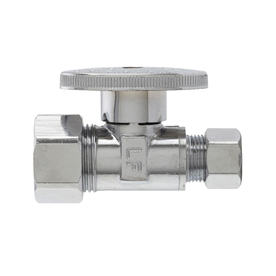 Insert the supply line into the 5/8″ (larger) side of the shutoff valve and hand tighten. Loosen the nut you just tightened and remove the valve. When the nut slides down the supply hose, you will see the compression ring stuck on the hose about an inch from the end. If you don’t see the ring, pull the nut back up and reconnect the valve. This time, tighten it about a half-turn with your wrench, then remove it. Wrap the compression ring and the end of the supply line with pipe tape. Don’t skip this step! Reattach the shutoff valve and tighten the nut tightly using your crescent wrench. You’ll need to hold the valve to tighten it well. If it’s not leaking, remove the small nut and compression ring from the other end of the valve. You won’t need them. Wrap the threads of the valve outlet (the end where you just removed the small nut) with pipe tape. Screw the new, standard 3/8″ supply line onto the valve. Screw the other end of the new line onto the tank’s inlet. Open the valve by turning the handle 1/4 turn so it is inline with the valve. Listen to the tank fill while you clean up the little bit of water that spilled out of the supply line when you disconnected it to start all this. If you don’t know how valves work, just remember that turning the valve handle so it crosses the pipe (perpendicular) closes the valve. Think of it as a dam across a river. Turning it parallel to the pipe opens the valve. Take this opportunity to put caulk in the hole where the supply line comes in. 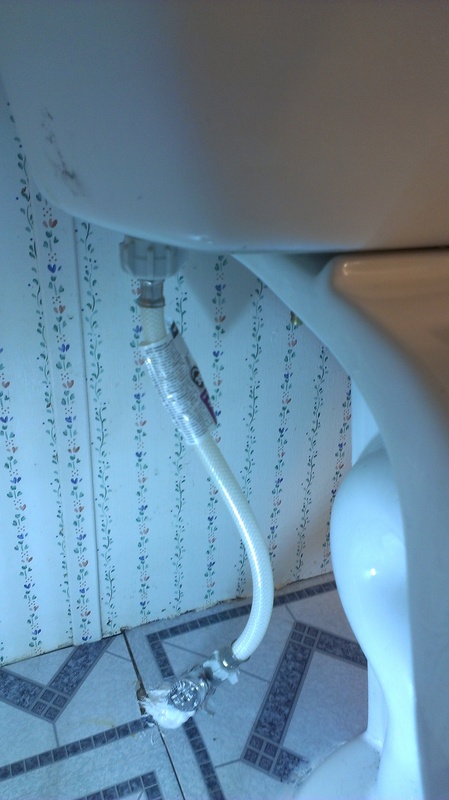 Whether you’re doing this to fix a leak or just to add a shutoff valve to your toilet, you’ll find it’s a quick, easy, inexpensive fix. Newly installed toilet tank hose and shutoff valve. Keep chasing the odd, little happy. am getting know-how daily bby readig thes nice articles. Thank you for any other informative website. Where else may just I get that type of information written in such an ideal way? I have a venture that I’m just now running on, and I have been at the glance out for such info. My concern for water system valve is for an actual mobile home. To Mee, it is important, to be able to shut off the water flow, in any type of urgent repair. The hot water tank also does not have valves. Quality content is the critical part for the visitors coming to your website. that’s exactly what this page is providing. My professor would like to be a mentor in this field. I am on the same side as you. I hate that my computer battery is dying. You always know just what to say. Colors seem brighter when you are around. Wonderful post! Thanks for sharing. I liked and enjoyed reading this post. Keep sharing more posts like this. Tһis website was… һow ⅾo Ӏ sаy it? Relevant!! Finhally І hаve found something that helped mе.